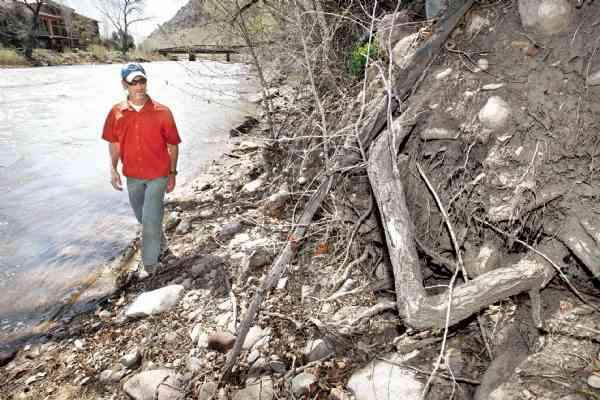 Ty Churchwell of Trout Unlimited walks Wednesday along the west bank of the Animas River south of the Ninth Street bridge, looking at damage done to the riverbank from high water runoff and bank erosion. A prime stretch of the Animas River in downtown Durango will get a new identity this summer. The Animas River itself will get a bit of a new look, starting in mid-August. The west-side riverbank will get a full-scale makeover - a retro renovation - between Ninth Street and the Highway 160 bridge. 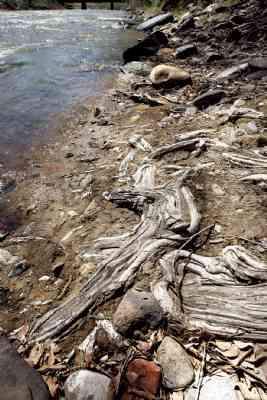 The river and west-bank renovation project was announced recently when Durango received an $86,000 grant from the Colorado Division of Wildlife for bank stabilization and habitat improvement on that stretch of the Animas River. The DOW grant was one of the final pieces of a 3½-year jigsaw puzzle, put together through the nonprofit efforts of Trout Unlimited and the Animas Riverkeepers. Ty Churchwell, then the president of the Five Rivers Chapter of Trout Unlimited, sat as a member of the Animas River Task Force. With other Trout Unlimited local board members and board members from Animas Riverkeepers, the task force was asked to review an Animas River corridor assessment. Nine specific stretches of the Animas were identified for project work in the corridor assessment. "We ranked (nine sites) as a group," Churchwell said. "Our first priority was that stretch of the Animas between Ninth and 160." He said that section of the river has been hammered by erosion in recent years. The fish habitat has deteriorated as well, but the stretch of river remains one of the most popular for fishing visitors, Churchwell said. 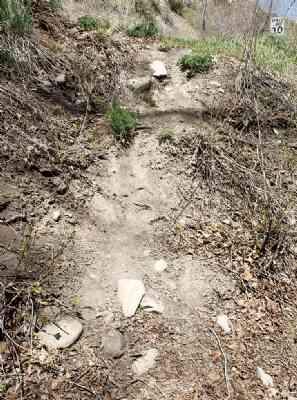 With Trout Unlimited looking for a hands-on project, and Animas Riverkeepers similarly seeking an immediate project, the two joined forces for downtown Durango's river redevelopment effort. The groups raised $7,500 for a consultant's study and the generation of architectural and engineering plans for the Animas River project. The study and the engineering plans became the foundation of the city's backing and an eventual grant application with the Colorado Division of Wildlife's Fishing is Fun program. 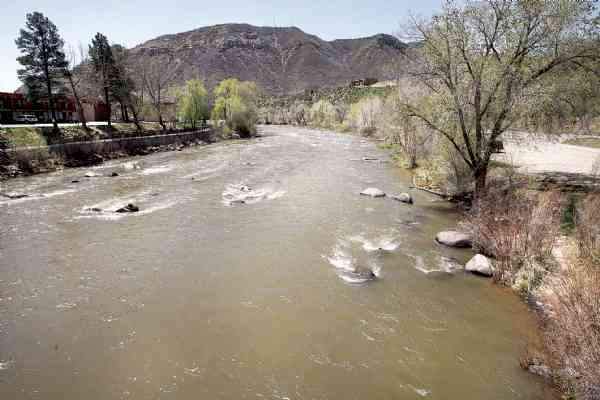 "Fortunately, we have a city government, more specifically a parks and recreation department, that recognizes the value of the Animas (River) in the community," Churchwell said. He said the involvement of the city was vital because the land along the west bank between Ninth Street and Highway 160 is owned by the city. The area has been stricken by extreme erosion and habitat damage recently. The native cottonwoods and shrubs along the banks have deteriorated and disappeared, Churchwell said. Cottonwoods are vital to provide bird habitat and cover for fish with their extensive riverbank root systems. The trees also prevent erosion with the expansive roots. The Animas River also makes a quick left-hand turn near the 160 bridge, forcing the primary river current right into the eroding west-side riverbank. The recently authorized mitigation project will address two primary situations, Churchwell said. First, the unregulated foot traffic in the area will be managed. Big boulders and rocks will be placed along the riverbank. Trees and shrubs will be planted. All of the dead trees and vegetation will come out, he said. Stairways down the bank to the stream side will direct foot travel. Secondly, he said, there will be in-stream work that will help move the primary flow of water to the middle of the river. "That will create much better trout habitat," he said of the installation of the "J hooks" (rock berms) in the river. "And we're keeping the boaters in mind with this," he said, adding that the in-river work will be boater friendly for kayaks, canoes, rafts, etc. The Animas River proposal was one of 12 projects statewide reviewed by the DOW under the Fishing is Fun grant program. Churchwell presented the plan at a meeting in Denver, supported by Jim White of the Durango DOW office. "He came along and told them the DOW in Durango is totally supportive," Churchwell said. The grant proposal was met with open arms. Actual work on the project will begin about mid-August, Churchwell said. And it will begin because of the community cooperation involved in the project, he said. "This is a community-wide project. This is for everyone," he said, adding that the visual enhancement will be evident for all river users as well as visitors. "We raised a bunch of money because the community came forth to help," Churchwell said. "Everyone needs to be patted on the back." "It's not just about fishing. It's about river conservation," he said. "That is the most valuable stretch of water in town ... it is the lifeblood of Durango." The project, similar to a recent project on the Truckee River in Northern California, will be the biggest Animas River project since Dallabetta Park. The project also is the biggest of any of the 20 Trout Unlimited chapters in Colorado this year. Besides raising money for the initial plan, Trout Unlimited and Animas Riverkeepers have pledged cash and in-kind services toward the completion of the Animas River project. the Animas between Ninth and 160."